Twelve years after the official debut of the Zonda at the 1999 Geneva Auto Salon, owner and chief designer Horacio Pagani pulled the covers off its successor. The 2012 Pagani Huayra was unveiled to the public at the 2011 Geneva Motor Show. Almost a year later we find ourselves outside the Pagani factory with the key in our hands, ready to experience the Huayra for the first time. Of course, that isn’t strictly true! 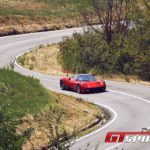 At the end of 2011 we had a first impression with this outrageous car when we visited Horacio and took a ride with Davide Testi, the Italian company’s official test driver. 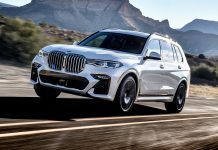 It’s an experience we cannot recommend enough, yet you can’t get a full impression of the car simply from riding shotgun in the passenger seat. By now you’ve probably heard all about the origins of the Huayra’s name. Pagani named it after Aymara Huayra Tata, the Argentinean god of wind. It is said that the Huayra Tata controls the breeze, the winds and the hurricanes that affect the mountains, ravines and slopes of the Andean Cordillera. The name holds strong resonance with the concept that drives the Huayra project. Wind and power are central to the car’s character. Sitting at the centre of the Huayra package is a unique, all-new carbon-titanium monocoque. The composite construction offers an extremely rigid platform while also contributing to the overall lightweight theme of the car. Safety is another aspect of the monocoque’s design, the titanium acts as a mesh, holding the parts together on impact. At both sides of the tub semi-chrome-moly subframes have been fitted to offer an exceptional rigidity-to-weight ratio. The sub-frame cradles numerous technical parts including the push-rod suspension. 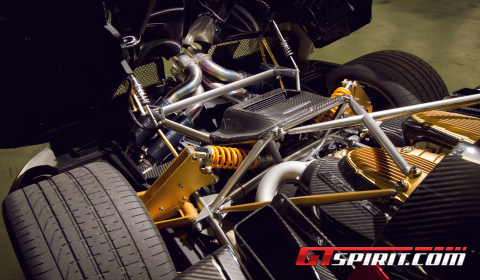 The suspension componants, constructed from Avional, were tested extenively in the Zonda R and are 30 percent lighter. Pagani’s constant focus on perfection has created a setup that ensures the best possible protection in case of an impact yet has an incredibly low weight. From the moment you walk into the Pagani factory, your eyes are drawn to the tiniest of features. Over 1,000 of the Huayra’s 4,700 parts are bespoke built by ASPA in Modena. Take for example, the Huayra badge fitted to the rear end of the car. It’s machined from a single solid piece of aluminium in a process that takes 24 hours. The engine cover alone takes five days to complete. We’ve already mentioned a few of the weight saving measures that the Huayra employs. It weighs in at less than 1,350kg, which is in fact a weight gain over the Zonda. 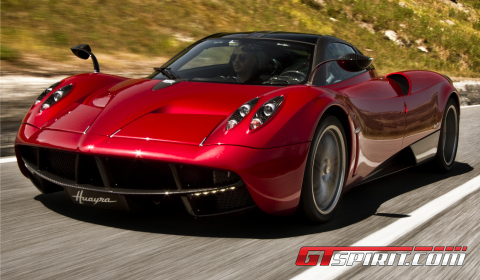 However, the Huayra remains the lightest sports car in its class. Compared to the Agera it’s 100kg lighter, and needless to say, it weighs some 530kg less than the Bugatti Veyron. At the heart of the Huayra is the M158 twelve-cylinder biturbo engine sourced through AMG. This is a new unit developed together with the German engineers at Affolterbach to meet Pagani’s specific needs in terms of technical specification and quality. A lot has been said about the new engine choice. Many Pagani fans wanted to see a naturally aspirated V12 in the Huayra. They wanted to retain the passion and sound of the Zonda’s outgoing M120 unit. The inclusion of the biturbo system has changed the cars character dramatically. However, it’s a change that has been forced through the discontinuation of the aging M120 unit. At every turn, Pagani’s customers were involved in the choice of engines. Customers made it clear that they wanted to retain the twelve cylinder engine, and so Pagani’s solution was a biturbo unit. The M158 is bespoke built for the Huayra. It’s based on the engine that powers the SL600, yet it has smaller turbos to reduce the amount of lag, a modified intercooler and dry sump lubrication. From 6.0 liters AMG managed to extact an astonishing 720hp and 1,000Nm of maximum torque. The power is converted to the rear wheels through a transverse sequential seven-speed gearbox with a dual plate clutch in favor over a dual-clutch system which is uniquely positioned low in the center of the car to reduce centre of gravity. Alone, this saves 70kg of weight. 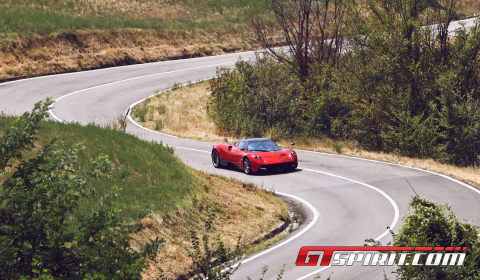 The shifts are exactly as you would expect from a car of the Huayra’s capability. They are enormously fast. With such an incredible amount of power available exclusively to the rear wheels, you’re probably wondering what it feels like. Actually, it’s a very easy car to drive, both slowly aggressively. The normal mode allows the wife to use it for a trip to the shops, although the limited storage space would mean she’d be limited to a single pair of Louboutins! Yet press the sport button and you can tackle the twistiest of mountain roads without ever really reaching the handling limits. All the buttons you need are to be found on the steering wheel, making adjustments is easy when travelling at speed. In sport mode the weight distribution is a perfect 50/50 balance which inspires confidence while at the same time gives you the feeling of limitless performance. We couldn’t find a situation where it didn’t feel this way. Similarly, if you leave the electronic stability systems enabled you hardly notice them working. The power delivery is both linear and progressive with power available throughout the rev range. Put your foot down though and in the blink of an eye, you’re immediately in license threatening territory! Of course, you probably won’t be paying attention at this point. The unique whooshing sound of the turbo’s spooling up is addictive. Perhaps even a little too addictive! The gearbox is controlled through paddle shifters behind the steering wheel or through a central-mounted gear lever, which offers you the mechanical experience of a normal manual stick. It’s an innovative solution for those that want the best of both worlds. The paddle shifters are a nice size, although we did find that the indicator buttons on the steering wheel were not particularly handy. Occassionally we’d hit the wrong one. It’s safe to say that they would take a while to get used to. As far as cruising round town goes though, the Pagani is very capable. It has a very stiff suspension but actually rides quite well at low speeds. The nose lift system ensures that the expensive carbon fibre nose doesn’t get scratched and overall, the gearbox behaves admirably at slow speeds. In fact, one of the biggest problems you are likely to come accross is the attention. Everywhere you go, the Huayra turns heads! Another clear talking point for Pagani fans and customers is the active aero package. The four flaps placed at the ends of the bodywork independently change the aerodynamic shape of the Huayra. They constantly react to changing driver inputs and vehicle conditions, ensuring the minimum friction coefficient and the maximum down force. A special command unit receives and processes information about speed, yaw rate, lateral acceleration, steering angle and throttle position, and acts so as to sustain neutral behavior in all conditions, the correct aerodynamic roll and braking balance. During braking, for example, the rear flaps and the front suspension raise to counteract the weight transfer allowing for better use of the rear brake force. If we’re honest, on the road, you never feel the effect. We simply couldn’t drive it fast enough. The real test for the active aero will be when owners take it on a trackday. Here the Huayra’s microprocessor will make thousands of calculations, aimed at optimising the aerodynamic efficiency. We don’t doubt that it actually works, and following behind offers others an excellent display. As we move from the city to the mountain roads just outside Modena, sport mode is enabled and the full might of the Huayra becomes apparent. The balance is perfect, allowing us to hook up the corners perfectly. Moving from one corner to the next is a simple squeeze of the throttle, and glace further towards the horizon. In the mountains it becomes further evident that the Huayra does have two personalities. The composure of city traffic is quickly forgotten as we press on through the hills that overlook Modena. The experience is perfect. 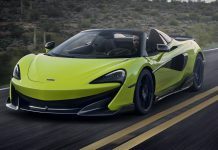 The car is nicely balanced, the carbon ceramic brakes slow the car effectively as we enter the hairpins and the power carries it out with a minimal amount of rear wheel slip, surprising for a 720hp rear wheel drive hypercar! 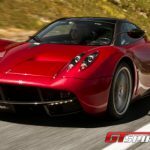 When the Huayra first came out, it was available in two specs, the standard spec and a clubsport spec with an added titanium exhaust upgrade provided through MHG in Germany and a set of carbon ceramic brakes. This package proved so popular that Pagani made it standard. You will also have heard Evo Magazine’s Harry Metcalfe explaining the Huayra’s fuel tank system that ensures if you have an accident, the Kevlar fuel lines are evacuated into the engine, leaving the fuel lines clear and the fuel tank locked off. It’s interesting and unique solutions like this that make the Huayra feel so special. At a time when hypercars are increasingly being built on a mechanised production line alongside regular production models, Pagani still hand build all their cars with incredible attention to detail. So much so that just twenty five cars can be built at the current Pagani facility over the space of a year. Pagani have at least 96 orders for the Huayra already, and twelve with an optional track package. That’s almost four years of production sold out! To reduce the waiting list and increase the production capacity, Pagani will soon move to a bigger facility located on the same industrial estate. At the moment that space is used to store customer cars, spare parts and for maintenance on the Zonda R but it should be ready at some point next year. Pagani will also set up each Huayra to a customer’s individual tastes, with chassis and damping options available to adjust. Similarly, the interior offers high levels of customization. We saw all sorts of interior colours on the Zonda and Pagani expect to produce the same for the Huayra. The center console even allows you to choose the ambient lighting colour for driving at night. We chose pink for our night journey! Overall, we loved our opportunity to experience the Huayra. It’s testament to four years of development. We haven’t driven anything like it before, the balance is perfect and the way it deals with the power is incredible. Sometimes it could be considered too good at what it does. However, we suspect many potential owners will probably use it to attract people’s attention on the streets of Monaco or London. It’s certainly well fitted to this role, being both easy to drive and so visually stunning. While it might not have the same raw sound as the Zonda, its new soundtrack is every bit as entertaining!